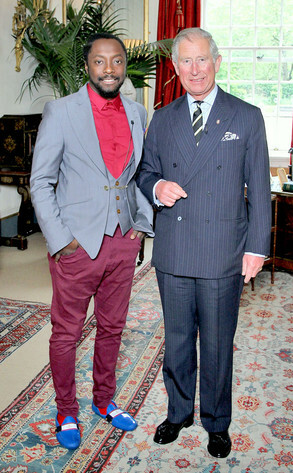 Pop star Will.i.am today donated £500,000 to deprived youngsters being helped by Prince Charles. The musician decided to make the gift — including part of his fee as a judge on TV talent show The Voice — to the Prince’s Trust charity after meeting young people on one of its personal development courses in Newham last month. He then visited Charles at Clarence House to ask how he could help. It is understood that Will, 37, who was raised by a single mother in one of the toughest areas of Los Angeles, wanted to put his taxpayer-funded fee to good use because of the way he feels Britons have taken him to their hearts. He said: “As a judge on The Voice, the people of the UK have welcomed me into their sitting rooms week after week and I feel very much at home here. The Black Eyed Peas frontman, a favourite of Princes William and Harry who performed at the Queen’s Diamond Jubilee concert last month, wants the money to be used to help young people learn about technology and how to use the internet and social media to develop careers. The donation builds upon philanthropic work the seven-times Grammy winner does in the US through his i.am.angel foundation, which he established in 2009. He said: “I grew up in East Los Angeles, one of the most under-served and tough neighbourhoods in America. “My life could have turned out very differently if it were not for the support and encouragement provided by my single working mum, my uncles and my teachers who encouraged me to dream, and to pursue my goal of getting into the music business. “My family made sure I understood that getting a good education and hard work were key to turning my dreams into reality and beating the odds that come with growing up in a disadvantaged situation. Paul Brown, director of the Prince’s Trust said: "We are absolutely delighted that will is making this substantial gift to the Prince’s Trust, which will literally transform the lives of many more young people.” The Prince’s Trust, which the Prince of Wales set up in 1976 using his pay-off from the Royal Navy, has helped more than 700,000 disadvantaged young people to get their lives back on track. It focuses on the unemployed and those who have struggled at school and are at risk of being excluded from society.